For the neighbourhood of Athens, see Acropolis (neighbourhood). The Acropolis of Athens is an ancient citadel located on a rocky outcrop above the city of Athens and contains the remains of several ancient buildings of great architectural and historic significance, the most famous being the Parthenon. The word acropolis is from the Greek words ἄκρον (akron, "highest point, extremity") and πόλις (polis, "city"). Although the term acropolis is generic and there are many other acropoleis in Greece, the significance of the Acropolis of Athens is such that it is commonly known as "The Acropolis" without qualification. During ancient times it was known also more properly as Cecropia, after the legendary serpent-man, Cecrops, the supposed first Athenian king. While there is evidence that the hill was inhabited as far back as the fourth millennium BC, it was Pericles (c. 495 – 429 BC) in the fifth century BC who coordinated the construction of the site's most important present remains including the Parthenon, the Propylaia, the Erechtheion and the Temple of Athena Nike. The Parthenon and the other buildings were damaged seriously during the 1687 siege by the Venetians during the Morean War when gunpowder being stored in the Parthenon was hit by a cannonball and exploded. The wooded Hill of the Nymphs is half-visible on its right, and Philopappos Hill on the left, immediately behind. The Philopappos Monument stands where, in the distant background, the coast of Peloponnese meet the waters of the Saronic Gulf. The Acropolis is located on a flattish-topped rock that rises 150 m (490 ft) above sea level in the city of Athens, with a surface area of about 3 hectares (7.4 acres). 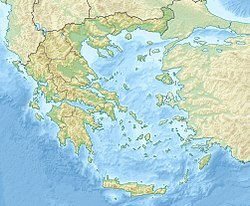 While the earliest artifacts date to the Middle Neolithic era, there have been documented habitations in Attica from the Early Neolithic period (6th millennium BC). There is little doubt that a Mycenaean megaron palace stood upon the hill during the late Bronze Age. Nothing of this megaron survives except, probably, a single limestone column-base and pieces of several sandstone steps. Soon after the palace was constructed, a Cyclopean massive circuit wall was built, 760 meters long, up to 10 meters high, and ranging from 3.5 to 6 meters thick. This wall would serve as the main defense for the acropolis until the 5th century. The wall consisted of two parapets built with large stone blocks and cemented with an earth mortar called emplekton (Greek: ἔμπλεκτον). The wall uses typical Mycenaean conventions in that it followed the natural contour of the terrain and its gate, which was towards the south, was arranged obliquely, with a parapet and tower overhanging the incomers' right-hand side, thus facilitating defense. There were two lesser approaches up the hill on its north side, consisting of steep, narrow flights of steps cut in the rock. Homer is assumed to refer to this fortification when he mentions the "strong-built House of Erechtheus" (Odyssey 7.81). At some time before the 13th century BC, an earthquake caused a fissure near the northeastern edge of the Acropolis. This fissure extended some 35 meters to a bed of soft marl in which a well was dug. An elaborate set of stairs was built and the well served as an invaluable, protected source of drinking water during times of siege for some portion of the Mycenaean period. Primitive Acropolis with the Pelargicon and the Old Temple of Athena. 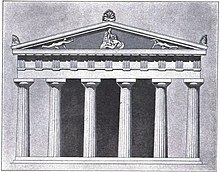 Proposed elevation of the Old Temple of Athena. Built around 525 BC, it stood between the Parthenon and the Erechtheum. Fragments of the sculptures in its pediments are in the Acropolis Museum. Not much is known about the architectural appearance of the Acropolis until the Archaic era. During the 7th and the 6th centuries BC, the site was controlled by Kylon during the failed Kylonian revolt, and twice by Peisistratos; each of these were attempts directed at seizing political power by coups d'état. Apart from the Hekatompedon mentioned later, Peisistratos also built an entry gate or Propylaea. Nevertheless, it seems that a nine-gate wall, the Enneapylon, had been built around the biggest water spring, the Clepsydra, at the northwestern foot. A temple to Athena Polias, the tutelary deity of the city, was erected between 570–550 BC. This Doric limestone building, from which many relics survive, is referred to as the Hekatompedon (Greek for "hundred–footed"), Ur-Parthenon (German for "original Parthenon" or "primitive Parthenon"), H–Architecture or Bluebeard temple, after the pedimental three-bodied man-serpent sculpture, whose beards were painted dark blue. Whether this temple replaced an older one, or just a sacred precinct or altar, is not known. Probably, the Hekatompedon was built where the Parthenon now stands. Between 529–520 BC yet another temple was built by the Peisistratids, the Old Temple of Athena, usually referred to as the Arkhaios Neōs (ἀρχαῖος νεώς, "ancient temple"). This temple of Athena Polias was built upon the Dörpfeld foundations, between the Erechtheion and the still-standing Parthenon. Arkhaios Neōs was destroyed as part of the Achaemenid destruction of Athens during the Second Persian invasion of Greece during 480-479 BC; however, the temple was probably reconstructed during 454 BC, since the treasury of the Delian League was transferred in its opisthodomos. 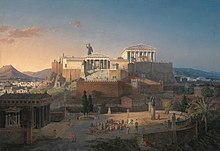 The temple may have been burnt down during 406/405 BC as Xenophon mentions that the old temple of Athena was set afire. Pausanias does not mention it in his 2nd century AD Description of Greece. 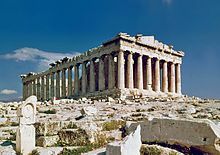 Around 500 BC the Hekatompedon was dismantled to make place for a new grander building, the "Older Parthenon" (often referred to as the Pre-Parthenon, "early Parthenon"). For this reason, Athenians decided to stop the construction of the Olympieion temple which was connoted with the tyrant Peisistratos and his sons and, instead, used the Piraeus limestone destined for the Olympieion to build the Older Parthenon. In order to accommodate the new temple, the south part of the summit was cleared, made level by adding some 8,000 two-ton blocks of limestone, a foundation 11 m (36 ft) deep at some points, and the rest was filled with soil kept in place by the retaining wall. However, after the victorious Battle of Marathon in 490 BC, the plan was revised and marble was used instead. The limestone phase of the building is referred to as Pre-Parthenon I and the marble phase as Pre-Parthenon II. 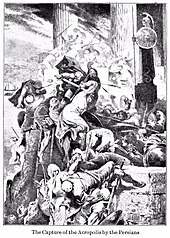 In 485 BC, construction stalled to save resources as Xerxes became king of Persia and war seemed imminent. The Older Parthenon was still under construction when the Persians indeed invaded and sacked the city in 480 BC. The building was burned and looted, along with the Ancient Temple and practically everything else on the rock. After the Persian crisis had subsided, the Athenians incorporated many architectural parts of the unfinished temple (unfluted column drums, triglyphs, metopes, etc.) into the newly built northern curtain wall of the Acropolis, where they served as a prominent "war memorial" and can still be seen today. The devastated site was cleared of debris. Statuary, cult objects, religious offerings and unsalvageable architectural members were buried ceremoniously in several deeply dug pits on the hill, serving conveniently as a fill for the artificial plateau created around the classic Parthenon. This "Persian debris" is the richest archaeological deposit excavated on the Acropolis by 1890. After winning at Eurymedon during 468 BC, Cimon and Themistocles ordered the reconstruction of the southern and northern walls of the Acropolis. Most of the major temples, including the Parthenon, were rebuilt by order of Pericles during the so-called Golden Age of Athens (460–430 BC). Phidias, an Athenian sculptor, and Ictinus and Callicrates, two famous architects, were responsible for the reconstruction. During 437 BC, Mnesicles started building the Propylaea, a monumental gate at the western end of the Acropolis with Doric columns of Pentelic marble, built partly upon the old propylaea of Peisistratos. These colonnades were almost finished during 432 BC and had two wings, the northern one decorated with paintings by Polygnotus. About the same time, south of the Propylaea, building started on the small Ionic Temple of Athena Nike in Pentelic marble with tetrastyle porches, preserving the essentials of Greek temple design. After an interruption caused by the Peloponnesian War, the temple was finished during the time of Nicias' peace, between 421 BC and 409 BC. Construction of the elegant temple of Erechtheion in Pentelic marble (421–406 BC) was in accordance with a complex plan which took account of the extremely uneven ground and the need to circumvent several shrines in the area. The entrance, facing east, is lined with six Ionic columns. Unusually, the temple has two porches, one on the northwest corner borne by Ionic columns, the other, to the southwest, supported by huge female figures or Caryatids. The eastern part of the temple was dedicated to Athena Polias, while the western part, serving the cult of the archaic king Poseidon-Erechtheus, housed the altars of Hephaestus and Voutos, brother of Erechtheus. Little is known about the original plan of the interior which was destroyed by fire during the first century BC and has been rebuilt several times. During the same period, a combination of sacred precincts including the temples of Athena Polias, Poseidon, Erechtheus, Cecrops, Herse, Pandrosos and Aglauros, with its Kore Porch (Porch of the Maidens) or Caryatids' balcony was begun. Between the temple of Athena Nike and the Parthenon, there was the Sanctuary of Artemis Brauronia (or the Brauroneion), the goddess represented as a bear and worshipped in the deme of Brauron. According to Pausanias, a wooden statue or xoanon of the goddess and a statue of Artemis made by Praxiteles during the 4th century BC were both in the sanctuary. Behind the Propylaea, Phidias' gigantic bronze statue of Athena Promachos ("Athena who fights in the front line"), built between 450 BC and 448 BC, dominated. The base was 1.50 m (4 ft 11 in) high, while the total height of the statue was 9 m (30 ft). The goddess held a lance the gilt tip of which could be seen as a reflection by crews on ships rounding Cape Sounion, and a giant shield on the left side, decorated by Mys with images of the fight between the Centaurs and the Lapiths. Other monuments that have left almost nothing visible to the present day are the Chalkotheke, the Pandroseion, Pandion's sanctuary, Athena's altar, Zeus Polieus's sanctuary and, from Roman times, the circular temple of Augustus and Rome. During the Julio-Claudian period, the Temple of Rome and Augustus, a small, round edifice, about 23 meters from the Parthenon, was to be the last significant ancient construction on the summit of the rock. Around the same time, on the North slope, in a cave next to the one dedicated to Pan since the classical period, a sanctuary was founded where the archons dedicated to Apollo on assuming office. 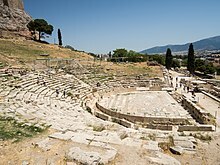 During 161 AD, on the South slope, the Roman Herodes Atticus built his grand amphitheatre or Odeon. It was destroyed by the invading Herulians a century later but was reconstructed during the 1950s. 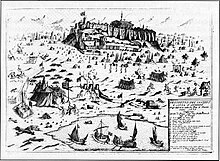 Depiction of the Venetian siege of the Acropolis of Athens during 1687. During the Byzantine period, the Parthenon was used as a church, dedicated to the Virgin Mary. During the Latin Duchy of Athens, the Acropolis functioned as the city's administrative center, with the Parthenon as its cathedral, and the Propylaia as part of the Ducal Palace. A large tower was added, the "Frankopyrgos", demolished during the 19th century. After the Ottoman conquest of Greece, the Parthenon was used as the garrison headquarters of the Turkish army, and the Erechtheum was turned into the Governor's private Harem. The buildings of the Acropolis suffered significant damage during the 1687 siege by the Venetians in the Morean War. The Parthenon, which was being used as a gunpowder magazine, was hit by artillery shot and damaged severely. Idealized reconstruction of the Acropolis and Areios Pagos in Athens, Leo von Klenze, 1846. During subsequent years, the Acropolis was a site of bustling human activity with many Byzantine, Frankish, and Ottoman structures. The dominant feature during the Ottoman period was a mosque inside the Parthenon, complete with a minaret. The Acropolis was besieged thrice during the Greek War of Independence (two sieges from the Greeks in 1821–1822 and one from the Ottomans in 1826-1827. A new bulwark named after Odysseas Androutsos was built by the Greeks between 1822 and 1825 to protect the recently rediscovered Klepsydra spring which became the sole fresh water supply of the fortress. After the independence, most features that dated from the Byzantine, Frankish and Ottoman periods were cleared from the site in an attempt to restore the monument to its original form, "cleansed" of all later additions. The entrance to the Acropolis was a monumental gateway termed the Propylaea. To the south of the entrance is the tiny Temple of Athena Nike. At the centre of the Acropolis is the Parthenon or Temple of Athena Parthenos (Athena the Virgin). East of the entrance and north of the Parthenon is the temple known as the Erechtheum. South of the platform that forms the top of the Acropolis there are also the remains of the ancient, though often remodelled, Theatre of Dionysus. A few hundred metres away, there is the now partially reconstructed Odeon of Herodes Atticus. View east toward the Acropolis under construction during summer 2014. The Project began during 1975 but as of 2017 it has almost ground to a halt. The goal of the restoration was to reverse the decay of centuries of attrition, pollution, destruction stemming from military use, and misguided past restorations. The project included collection and identification of all stone fragments, even small ones, from the Acropolis and its slopes and the attempt was made to restore as much as possible using reassembled original material (anastylosis), with new marble from Mount Penteli used sparingly. All restoration was made using titanium dowels and is designed to be completely reversible, in case future experts decide to change things. A combination of cutting-edge modern technology and extensive research and reinvention of ancient techniques were used. The Parthenon colonnades, largely destroyed by Venetian bombardment during the 17th century, were restored, with many wrongly assembled columns now properly placed. The roof and floor of the Propylaea were partly restored, with sections of the roof made of new marble and decorated with blue and gold inserts, as in the original. Restoration of the Temple of Athena Nike was completed in 2010. Every four years, the Athenians had a festival called the Panathenaea that rivaled the Olympic Games in popularity. During the festival, a procession (believed to be depicted on the Parthenon frieze) traveled through the city via the Panathenaic Way and culminated on the Acropolis. There, a new robe of woven wool (peplos) was placed on either the statue of Athena Polias in the Erechtheum (during a regular Panathenaea) or on the statue of Athena Parthenos in the Parthenon (during the Great Panathenaea, held every four years). Within the later tradition of Western Civilization and classical revival, the Acropolis, from at least the mid-18th century on, has often been invoked as a key symbol of the Greek legacy and of the glories of Classical Greece. The Acropolis is a klippe consisting of two lithostratiagraphic units, the Athens schist and the overlying Acropolis limestone. The Athens schist is a soft reddish rock dating from the upper Cretaceous. The original sediments were deposited in a river delta approximately 70 million years ago. The Acropolis limestone dates from the upper Jurassic period, predating the underlying Athens schist by 30 million years. The Acropolis limestone was thrust over the Athens schist by compressional tectonic forces, forming a nappe or overthrust sheet. Erosion of the limestone nappe led to the eventual detachment of the Acropolis, forming the present day feature. Many of the hills in the Athens region were formed by the erosion of the same nappe as the Acropolis. These include the hills of Lykabettos, Areopagus, and Mouseion . The marble utilized to construct the buildings of the Acropolis was sourced from the quarries of Mount Pentelicus, a mountain to the northeast of the city. ^ acro-. (n.d.). In Greek, Acropolis means "Highest City". The American Heritage Dictionary of the English Language, Fourth Edition. Retrieved September 29, 2008, from Dictionary.com website: Quote: "[From Greek akros, extreme; see ak- in Indo-European roots.]" ^ "History", Odysseus. Retrieved 2 December 2012. ^ Nicholas Reeves and Dyfri Williams, "The Parthenon in Ruins" Archived 2009-08-06 at the Wayback Machine, British Museum Magazine 57 (spring/summer 2007), pp. 36-38. Retrieved 2 December 2012. ^ Castleden, Rodney (2005). Mycenaeans. Routledge. pp. 64–. ISBN 978-1-134-22782-2. ^ Hurwit 2000, p. 74-75. ^ Hurwit 2000, p. 78. ^ "The springs and fountains of the Acropolis hill" Archived 2013-07-28 at the Wayback Machine, Hydria Project. Retrieved 2 December 2012. ^ Pomeroy, Sarah B. (1999). Ancient Greece: A Political, Social, and Cultural History. Oxford University Press. pp. 163–. ISBN 978-0-19-509742-9. ^ Starr, Chester G. "Peisistratos". Encyclopædia Britannica. Retrieved 2 December 2012. ^ "Acropolis fortification wall", Odysseus. Retrieved 2 December 2012. ^ Hurwit 2000, p. 111. ^ Hurwit 2000, p. 121. ^ "Athens, Pre-Parthenon (Building)", Perseus Digital Library. Retrieved 3 December 2012. ^ "Ictinus and Callicrates with Phidias", Architecture Week. Retrieved 3 December 2012. ^ "Mnesicles". Encyclopædia Britannica. Retrieved 6 December 2012. ^ McCulloch, John Ramsay (1841). A Dictionary, Geographical, Statistical, and Historical: Of the Various Countries, Places and Principal Natural Objects in the World. Longman, Orme, Brown, Green and Longmans. pp. 205–. ^ Mark, Ira S. (1993). The Sanctuary of Athena Nike in Athens: Architectural Stages and Chronology. ASCSA. pp. 72–. ISBN 978-0-87661-526-3. ^ Thomas Sakoulas, "Erechtheion", Ancient-Greece.org. Retrieved 7 December 2012. ^ Venieri, "Erechtheion", Odysseus. Retrieved 7 December 2012. ^ "The Acropolis of Athens". Retrieved 9 February 2013. ^ "The Sanctuary of Artemis Brauronia", Acropolis Museum. Retrieved 9 February 2013. ^ Mikalson, Jon D. (2011). Ancient Greek Religion. John Wiley & Sons. pp. 73–. ISBN 978-1-4443-5819-3. Retrieved 9 February 2013. ^ Brouskarē, Maria S. (1997). The monuments of the Acropolis. pp 56-57: Ministry of Culture, Archeological Receipts Fund. ISBN 978-960-214-158-8. Retrieved 9 February 2013. ^ a b Travlos, John, Pictorial Dictionary of Ancient Athens, London: Thames and Hudson, 1971. p.54. ^ "The Stoa of Eumenes", The Acropolis of Athens. Greek Thesaurus. Retrieved 9 February 2013. ^ Hurwit 2000, p. 279. ^ Nulton, Peter, The Sanctuary of Apollo Hypoakraios and Imperial Athens, Archaeologia Transatlantica XXI, 2003. ^ Steves, Rick (2011). Rick Steves' Greece: Athens & the Peloponnese. Avalon Travel. pp. 115–. ISBN 978-1-61238-060-5. Retrieved 9 February 2013. ^ "The Partenon", Ancient Greece. Retrieved 9 February 2013. ^ Melton, J. Gordon; Baumann, Martin (21 September 2010). Religions of the World, Second Edition: A Comprehensive Encyclopedia of Beliefs and Practices. ABC-CLIO. pp. 233–. ISBN 978-1-59884-204-3. ^ Neils, Jenifer (5 September 2005). The Parthenon: From Antiquity to the Present. Cambridge University Press. pp. 346–. ISBN 978-0-521-82093-6. ^ "Acropolis, Athens: Long description", UNESCO. Retrieved 9 February 2013. ^ Nicholas Reeves and Dyfri Williams, "The Parthenon in Ruins" Archived 2009-08-06 at the Wayback Machine, British Museum Magazine, No 57, 2007, pages 36–38. Retrieved 9 February 2013. ^ Hadingham, Evan (February 2008). "Unlocking Mysteries of the Parthenon". Smithsonian. ^ "The Acropolis Museum". Retrieved 9 February 2013. ^ a b Fani Mallouchou-Tufano, "The Restoration of the Athenian Acropolis" Archived 2012-12-02 at the Wayback Machine, University of Michigan. Retrieved 9 February 2013. ^ "2010 – 2011, The progress of restoration on the Acropolis", The Acropolis Restoration News, July 2011. Retrieved 9 February 2013. ^ "Acropolis Restoration Project-Lecture by Maria Ioannidou, Director, Acropolis Restoration Service", Columbia University. Retrieved 9 February 2013. ^ "Panathenaic Festical". Archived from the original on 2012-04-27. ^ Regueiro y González-Barros, Manuel; Stamatakis, Michael; Laskaridis, Konstantinos (2014-11-30). "The geology of the Acropolis (Athens, Greece)". European Geologist. 38: 45–52. ^ "Material: Pentelic Marble · Art of Making". www.artofmaking.ac.uk. Retrieved 2018-12-13. Andronicos, Manolis (2005). The Acropolis. Ekdotike Athenon S.A. ISBN 9789602130063. Bouras, Charalampos; Ioannidou, Maria; Jenkins, Ian (2012). Acropolis Restored. British Museum Press. ISBN 978-0861591879. Brouskarē, Maria S. (1997). The monuments of the Acropolis. Ministry of Culture, Archeological Receipts Fund. ISBN 978-960-214-158-8. Cohen, Beth. (2010). "Deconstructing the Acropolis: The Acropolis Museum, Athens, opened 20 June 2009 by Bernard Tschumi Architects." American Journal of Archaeology 114:745–753. Economakis, Richard; Bettella, Mario (2010). Acropolis: Ancient Cities. Artmedia Press. ISBN 9781902889061. Goette, Hans Rupprecht. (2001). Athens, Attica and the Megarid: An Archaeological Guide. London and New York: Routledge. Harris, Diane. (1995). The Treasures of the Parthenon and Erechtheion. New York: Oxford Univ. Press. Hurwit, Jeffrey M. (2000). The Athenian Acropolis: History, Mythology, and Archaeology from the Neolithic Era to the Present. Cambridge University Press. ISBN 978-0521428347. Hurwit, Jeffrey M. (2004). The Acropolis in the Age of Pericles. Cambridge University Press. ISBN 978-0521527408. Keesling, Catherine M. (2008). The Votive Statues of the Athenian Acropolis. Cambridge University Press. ISBN 9780521071260. Miller, Walter (2009). A History of the Akropolis of Athens. Gorgias Press. ISBN 978-1607244981. Neils, Jenifer (2005). The Parthenon: From Antiquity to the Present. Cambridge University Press. ISBN 978-0-521-82093-6. Neils, Jenifer, ed. (1996). Worshipping Athena: Panathenaia and Parthenon. Madison: Univ. of Wisconsin Press. Pollitt, Jerome J. (1990). The Art of Ancient Greece: Sources and Documents. New York: Cambridge Univ. Press. Rhodes, Robin Francis (1995). Architecture and Meaning on the Athenian Acropolis. Cambridge University Press. ISBN 978-0521469814. Shuter, Jane (1999). The Acropolis. Heinemann Library. ISBN 978-1575728551. Servi, Katerina (2011). The Acropolis: The Acropolis Museum. Ekdotike Athenon. ISBN 978-9602134528. Tanaka, Michitaro (1978). The Acropolis. Kodansha America, Inc. ISBN 978-0870110856. Wikimedia Commons has media related to Acropolis of Athens. Βασιλόπουλος (Vasilopoulos), Χρίστος (Christos) (2011). "Η ιστορία της Ακρόπολης" [The history of Acropolis]. Μηχανή Του Χρόνου (The Time Machine) (in Greek). Greece. NET. 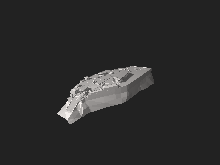 This page was last edited on 20 April 2019, at 10:44 (UTC).